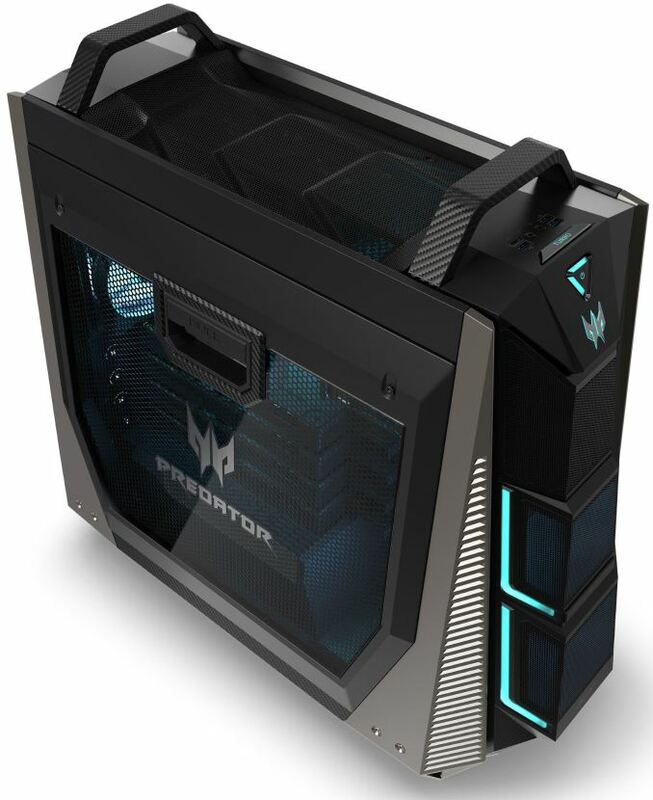 In one of many announcements from Acer at IFA, the company has revealed a powerful new gaming desktop in their Predator line, the Acer Predator Orion 9000. The new desktop will support up to an i9 Extreme Edition processor, Intel's i9 7980XE, with up to 18 cores and 36 threads. The higher core count versions will appeal more to prosumers and workstation users than to the bulk of a typical gamer's budget. It will also be able to squeeze in four AMD Radeon RX Vega graphics cards in CrossfireX, or up to two NVIDIA GTX 1080Ti’s in SLI. The Orion 9000 is being pitched for gaming at 4K+ resolutions, is VR capable, and can certainly take on compute loads. 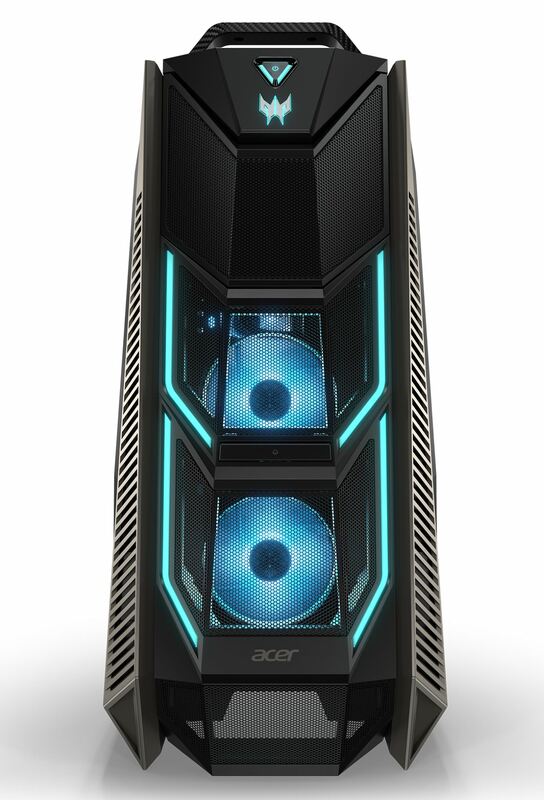 Acer says the Orion 9000 series is “power you can see” and "the most powerful PC we've ever made." Outside of the high-end specifications, the chassis itself looks to intimidate. It uses both black and silver colors with an angled front bezel like that of a stealth vehicle designed to deflect radar with angled cues around the entire chassis. There is a large windowed side panel with a latch on top for access inside. In fact, both sides of the case have that latch up top for tool less entry. RGB lighting flanks the angled front of the case as well as inside with optional LED fans lighting up the room and showing off the inside. Moving the case should be easier with the integrated handles up top as well as casters/wheels on the bottom. If overclocking is your thing and do not like to play around in the BIOS, Acer includes ‘one-punch’ overclocking to select turbo performance with a single press of the button. With overclocking though comes extra power use and of course heat. The Orion 9000 series feature liquid cooling and Acer’s IceTunnel 2.0, an airflow management solution separating the system in several thermal zones, each with an individual airflow tunnel to remove the heat. The front and top of the chassis have large metal mesh panels to take in and expel air. Five 120mm fan locations help move the air through, with some of the airflow intentionally directed behind the motherboard tray to cool storage devices. Detailed system specifications are a mystery outside of being Intel X299 based. 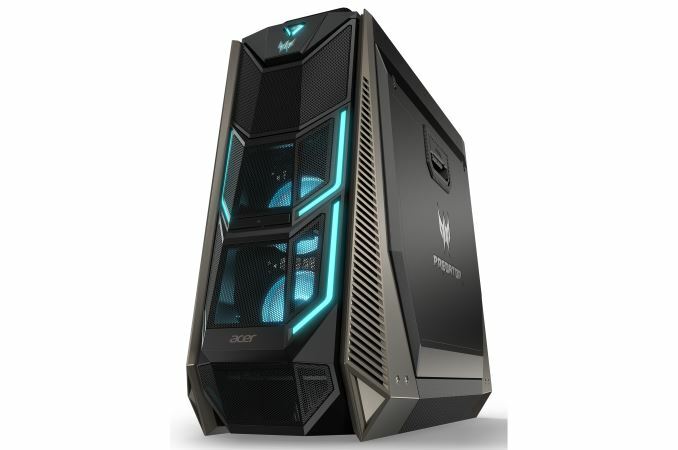 Though it is labeled a gaming machine, in practice it's going to pull double-duty as both a gaming and workstation machine, depending on the CPU used. Intel's high-end 18 core i9 7980XE makes for a good workstation, and conversely gamers are likely better off with the lower core count CPUs and their higher frequencies. We do know the system can support up to 128GB of quad-channel DDR4 memory allowing for plenty of memory intensive activities on the machine. Other connectivity includes two USB3.1 Gen 2 ports (Type-A and Type-C), eight USB3.1 Gen 1 ports (1xType-C and 7x Type-A) as well as two USB2.0 ports. The Predator Orion 9000 supports a total of three M.2 slots for storage purposes. Other details were not provided. 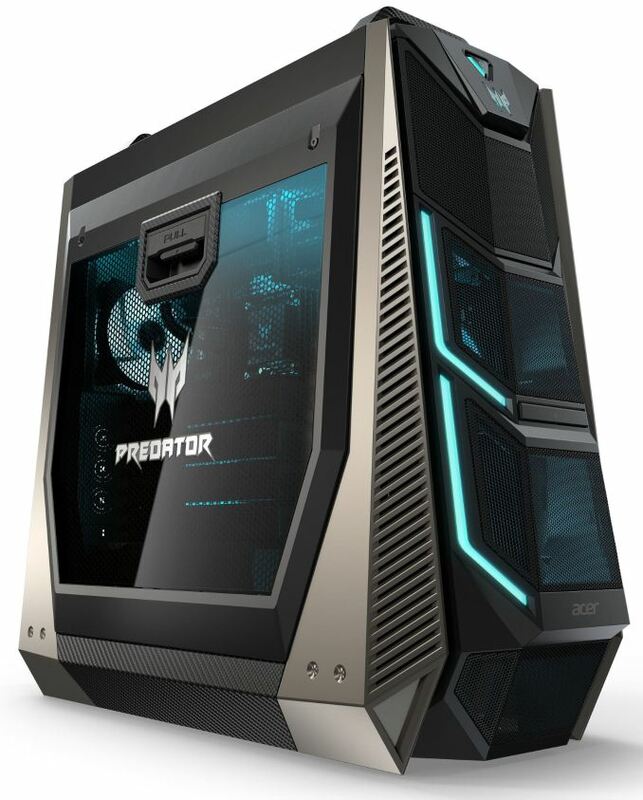 The Predator Orion 9000 Series gaming desktops will be available in North America in December with prices starting at $1,199; and in EMEA regions in November, starting at €1,999.